Not the point of it all. After my last post, there are those out there who if they read it would say I've gone off of the conservative reservation. Jed Babbin had a column at the American Spectator that I think would have him included in the list of people who think I'm suddenly a liberal anti-American scumbag. To someone like him, the Snowden revelations are clear cut, black and white. Without making too fine a point of it, Snowden is a punk, a thief, and comparable only to Bradley Manning, the Army private now being court-martialed for leaking hundreds of thousands of classified emails. 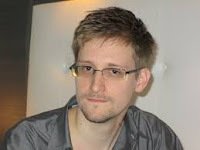 Snowden, like Manning, stole the information he leaked. Like Manning, he inflicted — with malice aforethought — damage on his country. Manning apparently did it in protest of the burden inflicted on him — he’s a gay activist — by the army. Snowden, a 29-year-old employed by a contractor working for NSA, doesn’t even have that excuse. There’s still no problem telling right from wrong here. Neither of these pusillanimous punks had the right to decide for himself what should be leaked or not. But that’s not enough to dissuade some on the left, including one Laura Donohue, a Georgetown Law professor who, to the university’s undying shame, directs the Georgetown Center on National Security and the Law. According to Donohue, it’s also improper for Verizon to be ordered to give the government the metadata on its customers’ phone calls. She contends that the law is being abused, wholesale, in violation of the Constitution. Apparently, Donohue has confused the NSA with the IRS. They are not hunting for Americans to oppress because of their politics or even their religion. If you read, for example, the NSA procedure on targeting individuals for interception of data, you’ll see that the NSA spends an enormous amount of time scurrying around and debating with its lawyers to avoid gathering data on the wrong person. That's some strongly worded stuff right there. Sounds like anyone concerned about the Fourth Amendment might now be considered by some conservatives/Republicans as being in league with the devil. Of course Babbin may have a myopic view as a result of his past roles that are defense related roles. I get where he is coming from. But the truth is that Babbin and his ilk are throwing the baby out with the bathwater. Yes, Snowden is a traitor for divulging state secrets, particularly anything he has shared with China and Russia. But that does nothing to change the fact that what he has revealed about the Prism program is some serious stuff. The Constitution is not worth defending if it is not going to be adhered to by government agencies. Yes, dirty pool has to be played when dealing with the nation's enemies. Rules may need to be bent. But they cannot under any circumstances, be bent when dealing with American citizens. That is the non-black and white of this situation. A traitor to national security has revealed that those responsible for national security have abused their power because of either over-zealousness, ineptitude or laziness. Bad source - but important to know. Snowden has damaged national security if he's shared other secrets with national foes, but not by revealing the Prism project and the blanket data collection on American citizens. That to me, seems a little closer to black and white. I don't think it should be illegal to reveal illegal or unconstitutional behavior. I think that protection should trump any other laws which may have been violated as a necessary result of revealing such illegal behavior, and provide immunity from such. I think that's absolutely essential to the continuous fight we must have against government overreach and abuse. And to answer the most common criticism of this idea: yes, I realize the government does illegal things all the time, and this precedent could be used to justify illegal behavior from those who simply dislike the government. You know what? I can live with that. If the government wanted to curtail that possibility, I have a simple suggestion: stop breaking the law. It's really that simple. There are valid points in your argument. I think the way to draw the line that can satisfy most on both sides is straightforward. Espionage is necessary. Some dubious activities may always be required. But if any illegal activities done by the government can be confined to non-citizens and particularly non-citizen spies or enemy combatants. Easier said than done but as far as drawing a line, it seems to be a fairer place. As far as protecting whistle blowers, I agree, they need full protection. But there is a difference between exposing unconstitutional behavior and giving state security secrets to the Russians or Chinese (allegedly). The latter does not deserve protection regardless of whether he was doing it to ensure his freedom because of exposing unconstitutional behavior. It would be easier to claim it is clear cut if he came back to the states to make his case instead of hiding. "But there is a difference between exposing unconstitutional behavior and giving state security secrets to the Russians or Chinese (allegedly)." I'm wondering who is alleging that he has done this? If it was someone with credibility, it got past me. As to him hiding out: maybe if we knew what he knows about how the spooks operate we would be hiding out as well. His life is over and he knew it before he did what he did. Pending further credible information, my first impression is that he is a patriot, not a scoundrel. The American people have a right to know when something is being done to THEM. This is not about enemies, it's about our fourth amendment rights. I think that we as American citizens benefited more from this than any potential enemies. And I'm predicting that history will judge it so.